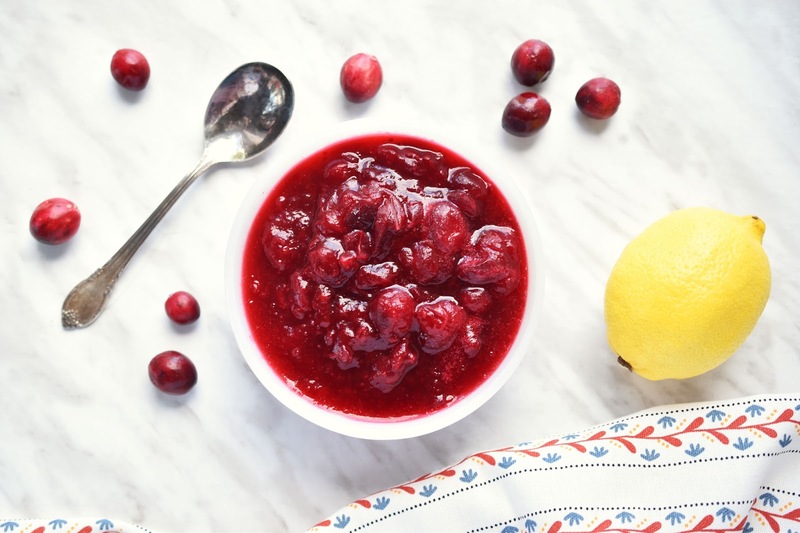 Is cranberry sauce a must-have on your Thanksgiving or Christmas dinner table? It is for me. I love the fresh, tart contrast it gives to more subdued holiday dinner fare like mashed potatoes. 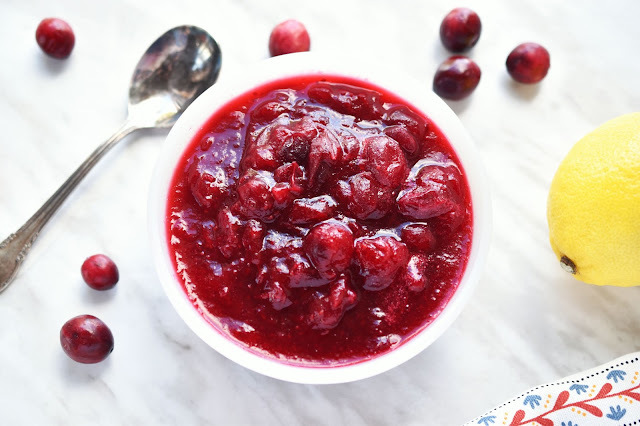 Canned cranberry sauce can work in a pinch, but it's so easy to make your own fresh, natural cranberry sauce that I think that's the better way to go. And you can make cranberry sauce a couple of days ahead too, to save time on meal prep once the big (busy!) Thanksgiving or Christmas meal day arrives. 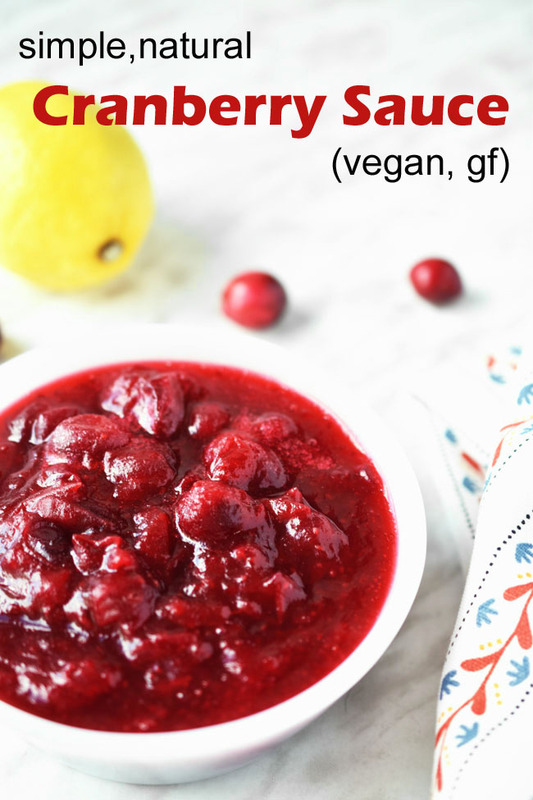 Cranberry sauce is so easy to make that you might well wonder why I'm even posting the recipe. I'm certainly not inventing the wheel. But I wanted to share with you my own recipe for cranberry sauce made without sugar, cinnamon or oranges of any kind. 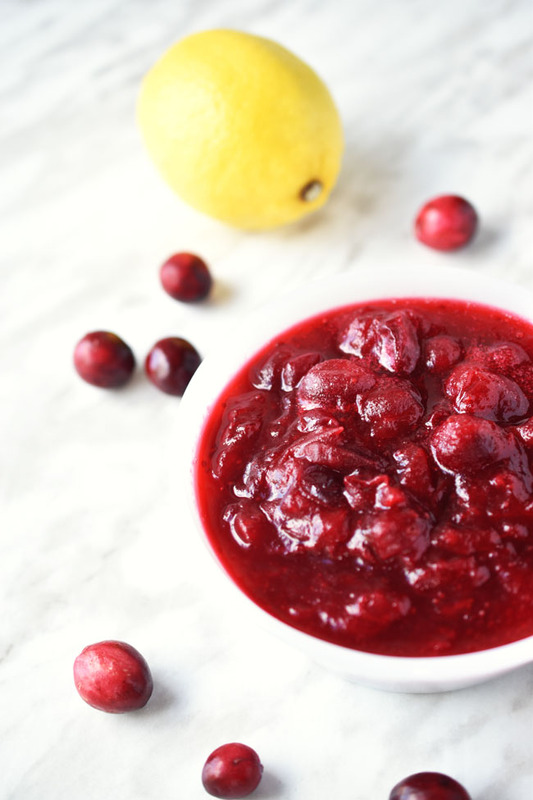 It's just a simple, natural cranberry sauce with only three easy ingredients (not counting water, because hopefully that springs from your tap). This recipe calls for fresh cranberries, to start. Go figure. I would recommend buying a few bags when you see fresh cranberries in the grocery store. You can always pop a bag or two into the freezer to make sauce with later. To review, cranberries and maple syrup. Then, freshly squeezed lemon juice as a natural preservative. 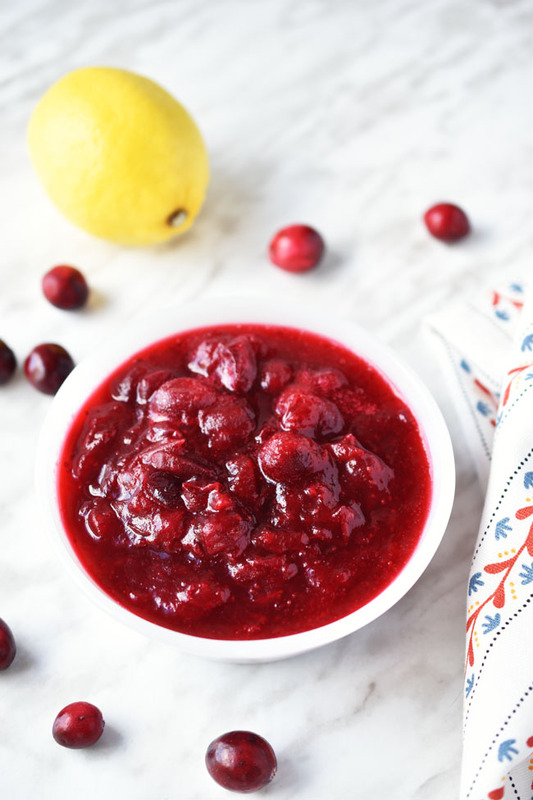 Not that this cranberry sauce will stick around for long. My kids aren't big fans, but my husband and I enjoy cranberry sauce. And whatever is left after Thanksgiving dinner can get baked into muffins and loaves or spooned over fresh, warm scones! 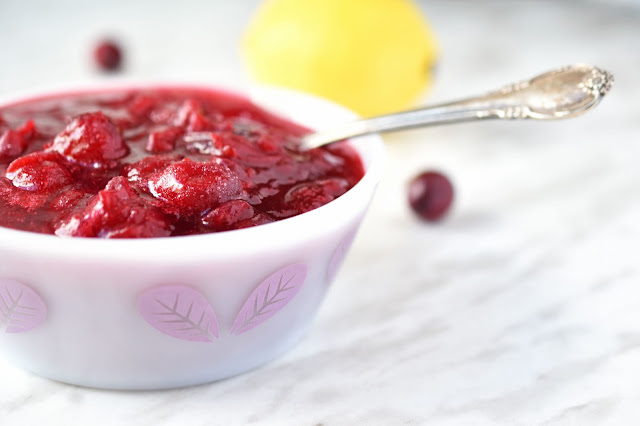 This cranberry sauce cooks up in under 15 minutes. It's naturally vegan and gluten-free and boasts the benefits of cranberries. 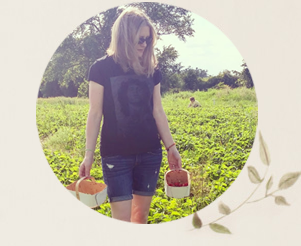 We know that cranberries are beneficial to our urinary tracts. They may also provide protection against stomach ulcers. Cranberries are high in antioxidants, as well as vitamins C, A and K. Generally, a diet rich in whole foods such as fruits, veggies and legumes has been shown to offer numerous health benefits. This cranberry sauce isn't super sweet. I like to preserve the tartness of the cranberries. 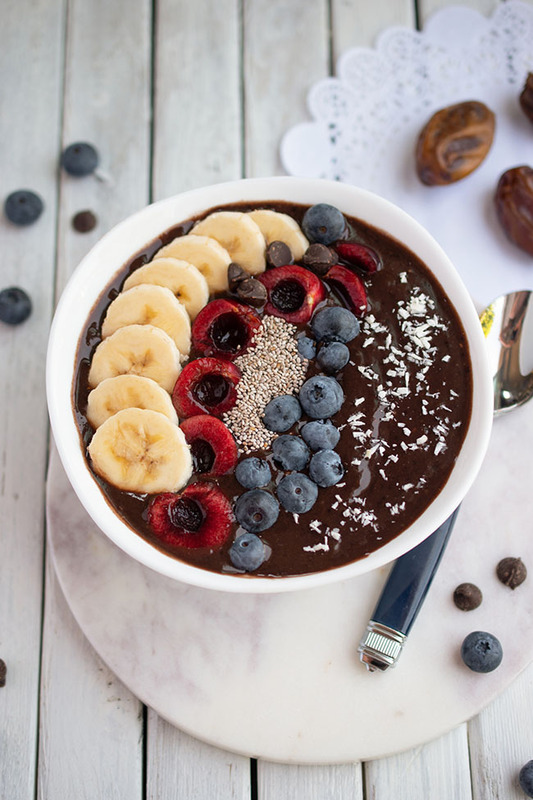 But if you are craving more sugar, you could add a tablespoon of organic cane sugar. Enjoy your Tofurky roasts, your tofu loaves, your mashed potatoes, your sweet potatoes this Thanksgiving or Christmas. But please, do not forget the cranberry sauce. Read on for this easy recipe. Yes to cranberry sauce? Or do you pass the bowl on, like my kids? Rinse cranberries and discard any withered ones. In a medium pot, stir together all ingredients. Bring mixture to a boil, reduce heat and simmer for 10 to 15 minutes, stirring regularly. The mixture will look too watery at first but will thicken. Mash cranberries slightly while cooking. Remove from heat and chill in a lidded container. yum ! I love cranberry sauce!